vst into next ch * rpt from * to * to last 2ch, miss 1ch, 1tr into last ch. Turn. (9vst). Next Row - 1ch, 1dc into base of 1ch, 1dc into each dc to end. Turn. Rpt last row once more. Turn. Fasten off. miss 1dc, 1tr into next dc, * rpt from * to * to end, working last tr into last dc. Turn. (9vst) Fasten off. Pattern Rows 3-4 - 1ch, 1dc into base of 1ch, 1dc into each dc to end. Turn. Fasten off. until 46 complete patterns have been worked or you have 184 rows from beginning. Next Row - Using first contrast colour, work Pattern Row 1 once. Turn. Fasten off. Work now measures approx 46.5 inches from beginning. Turn. vst row end, 1dc into base of 1ch, ss to first dc. Turn. end of row. Turn. Rpt last row once. Decorative Edge - 1ch, (ss, 3htr, ss) into base of 1ch, * miss 1dc, ss into next dc, miss 1dc, (ss, 3htr, ss) into next dc, * rpt from * to * all around four sides of runner to last 3dc, miss 1dc, ss into next dc, miss 1dc, ss to first ss on beginning of row. Fasten off. 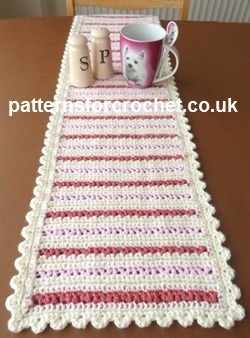 Hope you enjoy this dining table runner.